My first season with FDC, I showed up for an early Spring pickup to find ferns on the menu. Being, as my son would say, a “newb” I turned my nose up and moved on to the safe asparagus. Fast forward to another year, another pickup, this time with a sample of Pickled Fiddleheads. Ok, it’s a sample. Clearly it’s not going to kill to me… I fished out a little, curled frond and to the dismay of the same son, ate the plant. And it was GOOD! A total convert for all things fiddleheads I look back in amusement wishing I had the gall to try them sooner. For those of you who’ve yet to try them or just want to refresh with a simple recipe, I offer you Sauteed Fiddlehead Ferns, adapted from the queen of home-ec herself. Prep the fiddleheads! Sometimes this is done already but if there’s a papery (almost tomatillo-like but less sticky) skin on your fiddleheads, take it off. You have no interest in eating that, trust me. 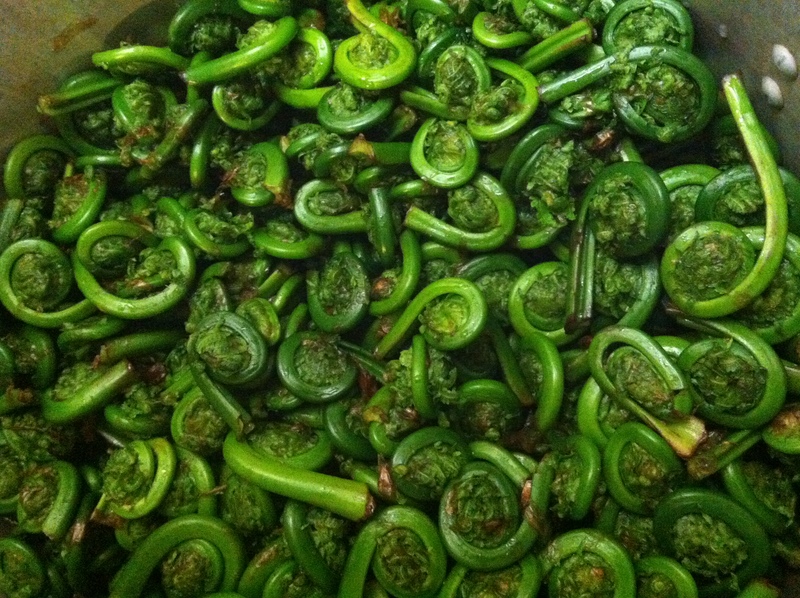 Then swoosh your fiddleheads around in a salt water and lemon juice bath. Just put the coarse salt and tbsp of lemon juice in cool water and repeatedly, gently submerge your fiddleheads. Remove from water and let drain. Steam fiddleheads using any method or tool of choice for about 5 minutes or until tender. Not limp, tender. Then melt butter in a skillet large enough to cook fiddleheads in a single layer for 2 minutes per side or until golden. Remove from pan and season with salt, pepper, and lemon zest if desired. I hope you too enjoy this fresh spring taste. It’s one of my favorite markers to track the arrival of spring.